Morocco have won their appeal against their bans from the 2017 and 2019 Africa Cup of Nations tournaments. The Court of Arbitration for Sport has overturned the ruling made by the Confederation of African Football after Morocco did not host the 2015 finals. It has also reduced a fine imposed on Morocco's FA (FRMF) from US$1m (£675,000) to $50,000 (£34,000). 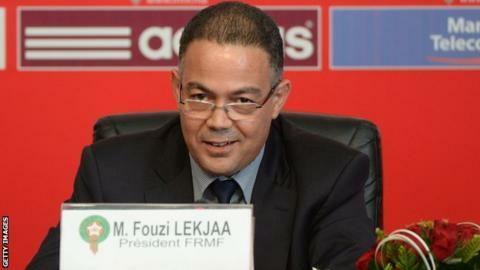 However, Caf's order for FRMF to pay 8m euros (US$8.7m, £5.85m) in damages "may be examined by another jurisdiction". Caf claims it suffered final losses because of the relocation of the 2015 finals from Morocco to Equatorial Guinea - only two months before the start of the event. Morocco wanted to postpone the tournament because of the outbreak of Ebola in Africa but their request was rejected by Caf, who, as well as moving the event to Equatorial Guinea, expelled the team from taking part. In February African football's governing body further punished Morocco, whose football federation responded by saying it "rejects all of these sports and financial sanctions" and lodged an appeal with Cas. After winning the appeal, FRMF vice-president Nourredine Bouchhati said the Cas decision was "excellent news". "It puts an end for now to this conflict with Caf, with which we will continue to work with normally,'' he told local media. "Now we will meet with national coach Baddou Zaki to begin our program of preparations."